Leonardo da Vinci is hot property these days. Recently we’ve had the silly furore about La Bella Principessa, and now there’s the 1 millionth new theory about the Mona Lisa, that world-famous, “mysterious” picture that is, in reality, a small but wonderful portrait of a Florentine merchant’s wife. The theory was announced in last week’s BBC2 documentary Secrets of the Mona Lisa, which I haven’t had time to write anything about yet. Let me just say that though the documentary made for riveting tele, the art history concerned was, well, let’s say optimistically dumbed-down. There were also a number of incongruous leaps made that I simply couldn’t understand. Long story short, the basic premise that was explored by Andrew Graham-Dixon is that Leonardo painted two Mona Lisas. One of them is of Lisa del Giocondo (née Gherardini), and it was commissioned from Leonardo by her husband, the Florentine cloth merchant Francesco. This is the story related by Vasari, and tradition has married his story to the painting now in The Louvre. The documentary then alerted us to the supposed existence of another Mona Lisa, commissioned by Giuliano de Medici, which we learn about from Antonio de Beatis, who writes that Leonardo himself told him about this, a second Mona Lisa. 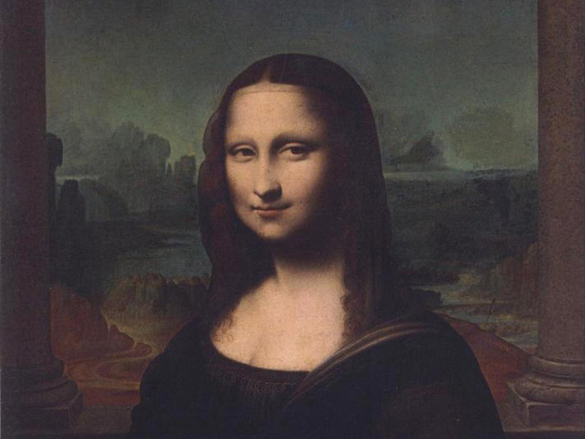 In the show, Graham-Dixon pursued this idea and he went off to visit the so-called Isleworth Mona Lisa (a bit about which here by Prof. Martin Kemp), and subsequently led us to believe that the Isleworth Lisa could be the “original” picture–which is to say, the one with the del Giocondo provenance–and that the Louvre painting is, in fact, a fanciful re-imagining of that painting done for Giuliano–a hyped-up version of del Giocondo, if you will. There are problems with this as a basic premise, but it nevertheless made sense in the context of the programme and it must be said that the plot spun by Graham-Dixon was engrossing. Especially interesting was Giuseppe Pallanti’s contribution to the show, who has done extensive and enthralling research on the Mona Lisa, the del Giocondos and their relationship with Leonardo’s family. But having spun that narrative things then got massively confused. Graham-Dixon changed his mind and basically departed from the view that two separate Mona Lisas once existed that were painted on two separate supports, and conversely claimed that the Mona Lisa we currently see when go to the Louvre (that is, of course, once we’ve elbowed our way through the crowds) is in fact painted on top of the “original”. This was based on various images gathered by Pascal Cotte, which were adduced to show that the current Mona Lisa obscures an erstwhile version of approximately the same subject. Basically it is supposed that Leonardo painted a “real portrait” of a real Florentine, in real Florentine dress etc. etc. (i.e. del Giocondo), but later painted over this to produce the “enigmatic” picture we now see in Paris, which is “un-real”. Gripping though all this was, in a Dan Brown-esque sort of fashion, I thought that Graham-Dixon ultimately lost his way. Things got muddled towards the end. The initial plot was abandoned too suddenly and based on spurious reasoning. Just for example, the whole eyebrows thing came up again, which is to say that Vasari waxes lyrical about how good Leonardo’s eyebrows are in his portrait of Lisa (“The eyebrows, likewise, were rendered in so nature a manner that one saw how the hairs issued from the flesh…”) but these are absent from the Louvre painting. 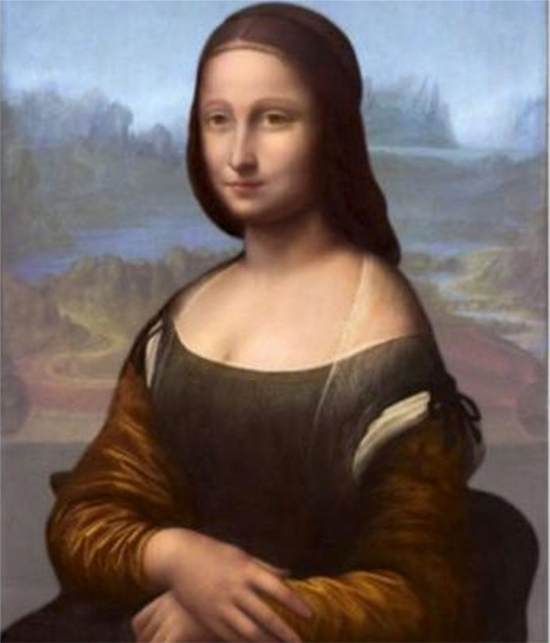 Graham-Dixon used this as a reason to cast doubt on the authenticity of the Paris picture, traditionally believed to be the portrait of Lisa known by Vasari. This is despite the fact that eyebrows probably did once exist but have since become eroded, perhaps as a result of over-zealous restorations (I can’t help but think that there’s something in this just by looking at the high-res image below, obtained from The Louvre’s website, in which the general eye area seems suspiciously smudgy–coincidentally, the same Pascal Cotte aforementioned believes that Mona Lisa did once have eyebrows and eyelashes). In any case, on the basis of AWOL eyebrows etc. Graham-Dixon concludes that there probably were two different Mona Lisas, one of which is possibly the Isleworth one. Curiously, though, he then offhandedly dismisses the idea that the Isleworth could be the original, since the face has never been tested, and we cannot therefore know its chemical and material constitution. So is this just another copy after all? Graham-Dixon thinks so (as do most sensible people, Prof. Kemp included). As a result of all this (and other evidence besides), the whole 2 separate portraits idea, derived from Vasari’s and de Beatis’s testimonies, was quickly dropped and not satisfactorily resolved; the viewer initially was told that what we are dealing with here is two separate pictures, but then, suddenly, it became a story about two pictures in one? These two are the one lurking beneath, which is a portrait of Lisa del Giocondo (and which has been digitally reconstructed by Cotte and is terribly ugly) and another one, painted on top for Giuliano (which is either imaginary or even, says Graham-Dixon, a lover of Giuliano’s!). Inherent in all this are serious problems–ultimately Graham-Dixon’s vacillations moved the programme from the realm of the enthralling to the exasperating. And all along I couldn’t help but think that the initial suggestion the Louvre painting is not the one familiar (by whatever means) to Vasari as a picture of Lisa del Giocondo is a troubling one, which ought to have been properly dealt with and substantiated. As it was, I ended-up feeling confused. Certainly I didn’t feel as though I’d just witnessed “one of the stories of the century” unfold before my eyes, which is what the doc. was promising to deliver. Anyway, since there’s still no time (!) to write about this properly, I am instead re-blogging Dr Bendor Grosvenor’s review of the show (below), which is fairly detailed and amounts to a compelling put-down of the show’s big claims. You can read Martin Kemp’s briefer thoughts here as well. Poor ‘Mona Lisa’. We can’t stop talking about her. Or speculating, theorising, investigating, filming, researching, and arguing about her. We seldom look at her. We are too busy trying to work out what we think ‘lies beneath’. But if we were to just stop and look at the picture, objectively and without pre-conceptions, we might then begin to accept that this mesmeric creation is simply a portrait of a Florentine lady who, as the old sources tell us, was born Lisa Gherardini. True, it is one of the best portraits every painted, by one of the greatest artist who ever lived, Leonardo da Vinci. But it’s still a portrait. It is, of course, too late to just ‘look’ at the Mona Lisa. The picture has acquired too much history and legend. So all we can do is tackle each new theory as it comes along, and either bat it away as the latest in a long line of optimistic fantasies, or say, ‘well there may be something to this’. I watched the latest theory, ‘The Secrets of the Mona Lisa’, on BBC2 last week. Regular readers might appreciate that, as an occasional BBC arts presenter myself, I’m loathe to critique other BBC arts programmes (though this one was made by independent production company). But the programme said it would not just rewrite art history, but reveal ‘one of the stories of the century’. And that’s a big claim. So – here goes. As a piece of telly, I thought it was excellent. Enjoyable, well made, and, as ever with Andrew Graham-Dixon, well presented. It was ‘Grade A’ telly. As art history, however, it scored a ‘C minus’. A number of basic art historical errors were made early on, and these set the programme onto the pursuit of a flawed – but sensational – thesis. Actually, the programme started well. We were presented with Prof. Martin Kemp of Oxford University, who might know more about Leonardo da Vinci than anyone else on the planet. He was asked some general questions about the Mona Lisa, but wasn’t given a great opportunity to say anything in any detail. He merely set the scene – a Professor to tell us that we were indeed about to look into a Very Important Painting. 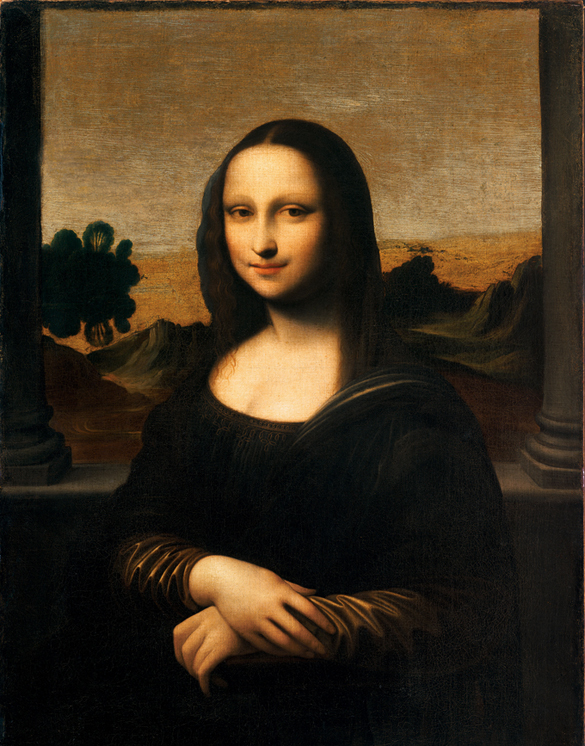 Leonardo undertook to paint for Francesco del Giocondo a portrait of his wife, Mona Lisa. He lingered over it four years and left it unfinished. It is at present in the possession of the French King Francis, at Fontainebleau. In this head anyone who wished to see how closely art could come to imitating nature could easily do so; since here were rendered all those minute niceties which can only be painted with the most delicate means; the eyes had that lustre and liquid effulgence which are always to be observed in real life, and around them were all those rosy and pearly tints together with the eyelashes which could not have been depicted except by the greatest subtlety. The eyebrows, likewise, were rendered in so nature a manner that one saw how the hairs issued from the flesh, thick in one place, scanty and scarce in another. The nose with its beautiful nostrils, rose and tender, seemed to be alive. The open mouth and its corners, united by the red of the lips and the flesh tints of the face, appeared to be not painted but real flesh. By intently observing the pit of the throat the spectator would be convinced that he could see the pulse beating in it, and could but feel that this was a picture to make even the boldest artist tremble and lose courage. Leonardo made use, also, of this device: Mona Lisa being very beautiful, he employed people to play and sing, and continually jested while working at the picture in order to keep the lady merry and thus banish the air of melancholy which is so often seen in painted portraits. In this picture of Leonardo’s there was a smile of such charm that it seemed more divine than human and was esteemed a miracle since it was nothing less than alive. Vasari (1511-1574) was first writing in 1550; a second edition was published in 1568. As Andrew Graham-Dixon finished reading from Vasari, he wondered whether the history of the Mona Lisa was really as ‘open and shut’ as Vasari implied. And with that we were off. “Apelles the painter. That is the way Leonardo da Vinci does it with all of his paintings, like, for example, with the countenance [or, ‘head’] of Lisa del Giocondo and that of the holy Anne, the mother of the Virgin. We will see how he is going to do it regarding the great council chamber, the thing which he has just come to terms about with the gonfaloniere. October 1503. In other words, the Mona Lisa was Lisa del Giocondo, wife of Francesco del Giocondo, a Florentine Merchant. Her maiden name was Lisa Gherardini. The programme then gave us an interview with the Italian art historian Giuseppe Pallanti, who has done much extraordinary research on the Mona Lisa. He showed us, for example, that Francesco del Giocondo’s house was very close to the house of Leonardo’s father, and, furthermore, that del Giocondo had been a client of Leonardo’s father. Pallanti has also found a record of Lisa’s death. So far, so conventional. Was it case closed? No – for Andrew Graham-Dixon then set out the theory, held by many people (and for various reasons, as we’ll see below) that there were two versions of the Mona Lisa. Certain things in the evidence so far, said Graham-Dixon, ‘don’t add up’. These included, first, that the Mona Lisa in Paris has ‘no eyebrows’ – whereas Vasari describes eyebrows. Second, Vasari says the Mona Lisa was painted for Francesco del Giocondo – but he never owned the Mona Lisa now in the Louvre, for Leonardo kept that painting with him, and after his death it was sold to the French royal collection. […] three pictures, one of a certain Florentine lady, done from life, at the instance of the late Magnificent Giuliano de Medici […]. This, said Graham-Dixon, was puzzling, for Vasari (in 1550) tells us the Mona Lisa was painted for her husband, Francesco del Giocondo – but Beatis in 1517 tells us, from Leonardo himself, that the picture was commissioned by Giuliano de Medici. All of these points added together convinced Graham-Dixon that we were dealing with two separate paintings. And so off we went in search of the missing picture. About which more in a moment, for here I want to just unpack a little further the evidence cited so far to suggest that there were two Mona Lisas. Because it seems to me that the programme has fundamentally misunderstood how we should be assessing the evidence mentioned above. First, those eyebrows. Are we really sure there weren’t any on the Louvre Mona Lisa? The picture is over 500 years old. Thinly painted eyebrows, made with a dark glaze as used by Leonardo (and thus of very soft pigments) could easily have been removed by some overzealous restorer. Such damage is the work of a moment, with the wrong cleaning solution, or too rough a sponge. Or, there could still be faint traces of eyebrow left – but we cannot clearly see them through the many layers of dirt and old varnish that now cover the painting. It is simply impossible to say in any objective way; ‘the Mona Lisa in the Louvre has no eyebrows, therefore Vasari must have been talking about a different painting’. Furthermore, Vasari almost certainly did not see the Mona Lisa in the Louvre. The picture was in France, which he is not known to have visited. He must have been basing his description on either a copy or someone else’s account. In any case, we can already see how inaccurate his remarks are anyway when he talks about the Mona Lisa’s ‘open mouth’ – when her mouth is in fact closed. And we ought to note here that the lavish praise Vasari gives the painting was no doubt ammunition in his broader campaign to convince the world of the benefits of his preferred school of Italian art; that is, of ‘disegno’ (where the design or drawing of a painting was the most important part) as practiced in Florence and Rome by the likes of Leonardo and Michelangelo, as opposed to ‘colore’ (where the colour and application of paint was the best feature of a painting) as practiced in Venice by the likes of Titian and Tintoretto. So I think that’s the eyebrows taken care of. Next we have the evidence of the different owners, or commissioners of the painting. We have Vasari saying in 1550 that Leonardo ‘undertook to paint for Francesco del Giocondo’ a portrait of his wife. But apparently in 1517 Leonardo tells us (via de Beatis) that it was painted for Giuliano de Medici. Does this discrepancy point to two different paintings? I don’t think so. there was also a picture in which a certain lady from Lombardy is painted in oil from life, quite beautiful, but in my opinion not as much as the lady Gulanda, the lady Isabella Gulanda’. Was one of these pictures the ‘Florentine lady’ de Beatis saw? Or is he (as is more likely) in a bit of a muddle about names and pictures and who commissioned what? For how many of us really can recall with clarity all the details of conversations we’ve had the day before, on all topics? De Beatis, unfortunately, reveals himself to be a somewhat unreliable witness when he says that Leonardo was then in his seventies, when he was actually 65, and that a paralysis on the right side of Leonardo’s body meant he couldn’t reach such artistic heights again – when of course Leonardo was left-handed. In other words, there really isn’t much in the way of reliable evidence, in the good old-fashioned historical sense, for us to say ‘there were two Mona Lisas’. Maybe both Francesco del Giocondo and Giuliano de Medici were involved in somehow pressing Leonardo (who was famously loathe to take commissions at that time in Florence) to paint Lisa. The point is, we just don’t know. The story ignores art history, denies the principles of connoisseurship, and bypasses the experts. The whole thing is a little sad, especially for anyone visiting the display who is hoping to see a masterpiece by Leonardo. There’s a lot to be said for first impressions, and I did well not to jump backwards in shock. It’s too good in my opinion for any of the other school of Leonardo painters… I think it’s not beyond the realms of possibility that this is the picture that Francesco [del Giocondo] took, and then Leonardo goes off and paints another picture, and that’s the ‘Mona Lisa’ [in the Louvre]. […] developed a new test to authenticate paintings by Rembrandt; it compares the subtle distribution of light and shadow measured as histograms to isolate an artist’s unique way of painting. Sadly, attribution by computer simply doesn’t work. Nobody of any serious repute in the world of Rembrandt authentication is ever going to rely on Dr Asmus’ Rembrandt histograms. I’ve never heard them mentioned before. And it was wrong of the programme to suggest, to a general audience, that attribution by computer is even possible in the first place. Furthermore, we were told by Dr Asmus himself that his initial tests (which showed a result of ’99%’ certainty that the Isleworth picture was indeed painted by Leonardo) were made on the basis of a photograph of the Isleworth picture taken on an ‘instamatic camera’. We were even shown the bad photograph on the screen. It’s one thing to try and compare, with the aid of a computer, artistic techniques on the basis of good digital photos – but quite another to try it on the basis of a poor quality print. So when Dr Asmus concludes that his tests ‘demonstrate that the technique for blinding light and shade in each face [that is, the Isleworth Mona Lisa and the Louvre Mona Lisa] appears uncannily similar’, he is merely observing the characteristics of a copy. 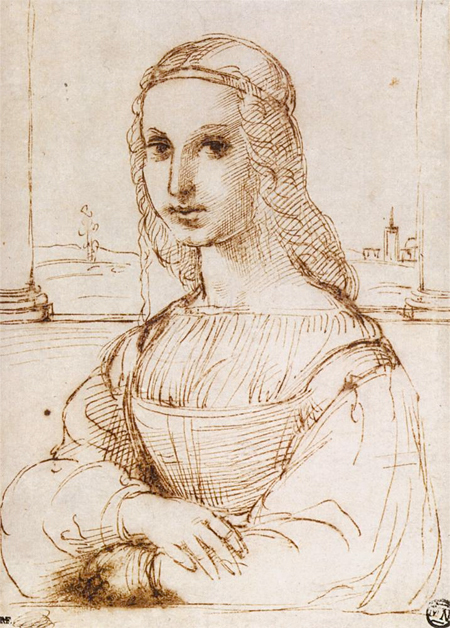 Another piece of evidence we were shown in favour of the Isleworth painting – and as evidence in that there were once two Mona Lisa’s – was a drawing by Raphael which is said to be a ‘a copy’ of the Mona Lisa (below). The drawing shows a woman with a similar pose of hands, the head in the same direction, a landscape background, and two columns on either side of her. The Isleworth backers say this relates more closely to their picture than the Louvre one. But of course it does not. There are too many differences between Raphael’s drawing and both the Louvre picture and the Isleworth picture for us to say it is a direct ‘copy’ of either. The ledge behind the sitter is at a higher level. The dress, both across the chest and the sleeves, is different. The landscape is different. Perhaps Raphael, whose own portraits at this date follow similar poses, was making an interpretation of the Mona Lisa, if he saw it, or a recollection of it. 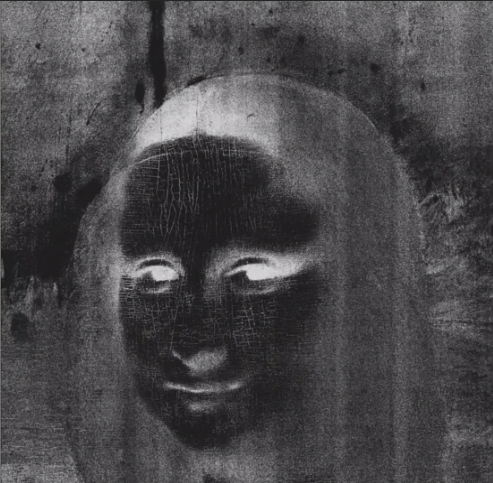 In the end, Graham-Dixon decided that the Isleworth Mona Lisa wasn’t by Leonardo. His logic was curious. He correctly noted that the usual ‘barage of scientific tests’ such as infra-red, x-ray, carbon dating etc. cannot tell us that Leonardo definitely painted the Isleworth picture, only that he might have done (and in fact only that any half decent artist from the period might have done). 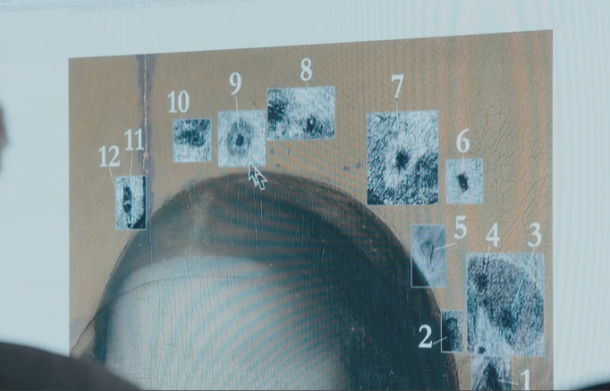 He then, however, looked at the location of the paint analysis samples taken by the ‘Mona Lisa Foundation’ (which acts as cheerleader for the Isleworth picture) and noticed that none were taken from the face itself. He wondered if a later restorer might have interfered with the head in the Isleworth picture, to somehow ‘bring it up’ to a level good enough to make it appear Leonardo-esque. ‘Until the face is tested, doubt remains’, he concludes, as if (again) an attribution to any artist can be achieved by something as straightforward as a scientific test. So, with the Isleworth picture duly ruled out (which was, I admit, a relief**), we followed one final lead on the hunt for the ‘other’ Mona Lisa. Enter Pascal Cotte, the scientist and inventor of the Lumiere multi-spectral high definition camera. The camera allows us, he claimes, to ‘peel back the layers of a painting, like an onion’, and he can reconstruct the way the painting was made as a result. M. Cotte took a series of multi-spectral scans of the Louvre Mona Lisa in 2004, and has been ‘decoding’ his results ever since. This programme was the first time he unveiled them. Now, regular readers will know that AHN and Pascal Cotte have ‘previous’. His recent analysis of Leonardo’s ‘Lady with an Ermine’ showed, he said, that the picture was first not painted with an ermine, but with the hands in a different place. Then the ermine was added, and moved. Having looked at the published photos, I concluded that M. Cotte was leaping to conclusions. You can read about that here. And I’m afraid to say that this time I think M. Cotte’s eyes are again deceiving him. The last part of the programme followed M. Cotte taking us through ever more extraordinary theories; that Mona Lisa was first painted with an elaborate head-dress, which Leonardo then scraped off; that she may have had a blanket on her lap (like the Queen Mum); that she once had a much larger head; that her face was moved 14 degrees; that her mouth was originally smaller; and so on. My favourite was the discovery of 11 hairpins (below), which were determined not to be random array of damages or blemishes (for example) by the fact that there were part of a special type of headdress, into which hair pins went in almost random manner. The conclusion? That the Mona Lisa in the Louvre was actually two paintings all along. Leonardo had begun to paint Lisa del Giocondo, just like Vasari and Vespucci said. But then he painted over her, and put someone else’s head on instead. Graham-Dixon speculated that this may have been a lover of Giuliano de Medici, Pacifica Brandano. M. Cotte has made a digital recreation (below) of what the ‘original’ Mona Lisa looked like (answer; Gollum’s mum). I’m sorry to say that all this is scarcely believable. I find it extraordinary that for decades now art historians have wrung their hands about the dangers of ‘connoisseurship’ – that is, the ability to look at the surface of a painting and tell who painted it – but now some are prepared to accept completely the much more dubious interpretation of images underneath a painting. We are now so reluctant to trust our own eyes, that we outsource these questions to scientists, and just because the results are presented by a man or woman in a white coat (or in this case a bow tie) we feel compelled to accept them. Science must be right. But I’m afraid it isn’t – not always. And science in art history is in its infancy. We have no way of verifying M. Cotte’s tests. He’s the only one with a camera. And we haven’t tested nearly enough paintings for us to say with confidence that we know how to interpret such images. In fact, it seems to me to be quite easy to question Cotte’s results, just by using common sense and one’s own eyes. Where M. Cotte sees a larger head (below), artists and art historians will see a straightforward ‘penumbra’, which is the area of dead colour an artist lays down on the panel or canvas as a background colour, and then begins to paint the head on. Since we know that the Mona Lisa was painted over a number of years by Leonardo, it is likely that the background was added at a later stage than the initial life sittings, accounting for the differences M. Cotte’s cameras have identified around the head. Indeed, all M. Cotte’s images prove is that Leonardo, like so many portraitists, fiddled with and changed his composition as he went along. This is a long way from saying; ‘it’s two different people’. Now that Pascal’s book is out in all its visual glory, and in the wake of the media interviews, edited as always to emphasise difference, it is worth laying out briefly how his researches look to me. It represents an extraordinary body of dedicated effort. He asked me for comments for his website – knowing that I disagreed with some of his interpretations. He is a good guy. The LAM technique undoubtedly provides an important new weapon in the armoury of those interested in scientific examinations of layered paintings. The Holy Grail of scientific examination is to disclose the successive layers that lie below the present surface. Pascal’s mode of analysis, adapting mathematical techniques from signal processing, is revealing far more from the deeper layers than was previously possible, but it does not definitively isolate information from a single layer. We are also unclear as to what is happening as the different frequencies of light penetrate the paint layers to varying degrees and interact in diverse ways with the varied optical properties of the materials within the layers of the picture. This means that tricky acts of interpretation are necessary – even more difficult than is the case with x-rays and infrared. There is always the danger of seeing what we want to see. None of us are immune from this. Looking at a selection of the LAM images as an art historian, I can see things that are wholly consistent with Leonardo’s creative methods, such as the indication of the use of cartoon and the restless manoeuvrings of contours. Some of what Pascal sees and reconstructs, such as the elaborate headdress, makes no sense to me in terms of design procedures or in terms of Renaissance paintings. I have difficulties with his detailed reconstructions of finished or semi-finished paintings under the surface of the present one. Leonardo’s processes were very fluid, with things coming and going, and with varied levels of finish across the picture. There is obviously a question of presentation here, and I would have resisted the temptation to translate the complex and often ambiguous images from the lower layers into such definite “pictures”. My strong sense, at this early stage in our understanding of what we are looking at, is that we are witnessing something consistent with the documentation and with Leonardo’s ways of proceeding. I see the painting beginning as a direct portrait of Lisa – building on the innovations of Leonardo’s Milanese portraits – and becoming increasingly conceptualised as picture that combines the combines the tropes of Renaissance love poetry with a profound interest in the microcosm of the human body and the “body of the earth”. I see a steady evolution from portrait to “picture”. The change in her draperies from a Florentine style (as Pascal shows) into a more conceptualised array of veils etc., is part of this process of generalisation. All this is consistent with the idea I first expressed in my 1981 monograph, that Giuliano de’ Medici asked Leonardo to finish the beautiful and remarkable picture when they were both in Rome from 1513-16. Pascal is opening up very important fields for analysis. We are at the beginning, Anyone is unwise to pronounce with certainty at this stage. I will have to make some sense of all this for the monograph of the Mona Lisa that I am currently writing with Giuseppe Pallanti. All of which reinforces my earlier scepticism about Cotte’s analysis of Leonardo’s Lady with an Ermine. Anyway, it’s a shame the latest Mona Lisa programme didn’t conclude with some form of independent assessment from Prof. Kemp. He was introduced at the beginning as an expert, why not have him at the end? In all the art discovery programmes I’m involved in, we always feel it imperative to show the audience some form of 3rd party, academic endorsement. So far, the Louvre has said rien. I haven’t yet mentioned another picture that Graham-Dixon went to see as a possible ‘other’ Mona Lisa; a work in Russia. It was clearly a later copy – not even a very good one – and eventually, with the help of more science we were shown that it couldn’t have been by Leonardo, for the ground layer dated to the 17th Century. But a few days after the BBC programme went out, there was a fresh flurry of excitement about a ‘new Mona Lisa’. It was the same picture (detail below)! Only this time, it had the name of ‘leading da Vinci scholar’ Prof. Carlo Pedretti attached to it. Why is he so confident that the Russian picture has a chance of being by Leonardo? Because he too has developed a ‘new art analysis software’. So we’re back to square one in the Mona Lisa game, anything goes, as long as you can get enough media hype. Computer software, ‘magic cameras’, mis-interpreted x-rays, optimistically assessed paint analysis, the views of scientists who don’t know their way around a painting; is this to be the new way of deciding (at least in the public arena) what is and what is not a Leonardo (or a Michelangelo or whatever else is next)? Not if I have anything to do with it. The public deserves better. I’m not claiming to be uniquely right in any of the above. Do let me know what you thought of the new claims. * I’ve been asked to see a few pictures in ‘bank vaults’. It’s usually a sure sign of something being a dud. ** This is not intended to be an exhaustive critique of the Isleworth Mona Lisa – I might get round to that one day. Update – a reader alerts us to the fact that the new ‘Russian’ Mona Lisa was apparently that sold at Christie’s in New York as a copy for $122,000. The provenance would fit the bill for that shown in the Graham-Dixon progreamme, where oddly enough the recent auction history was not mentioned. The image looks the same too.